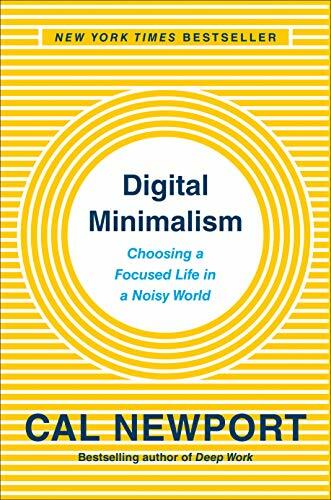 After quitting Facebook and uninstalling Instagram, I stumbled onto the book Digital Minimalism by Cal Newport. This book makes the case and gives advice on what I already knew. Social media, smartphones and other digital distractions are killing our ability to focus. Our attention spans are suffering. We are trading our ability to think more deeply to a handful of tech giants for random dopamine hits and the feeling of being connected. That may sound harsh, but in addition to all the good things that social media provides, that is what is happening. My observation was that social media had gradually become more and more addicting. And if the current trends continue, it will just get worse. (AR and VR are coming). Only when I paused to see the shallowness of it all was the spell temporarily broken. I used that opportunity to step away from Facebook and Instagram (Twitter is next). For the most part, I enjoyed the book Digital Minimalism. The arguments on why we need to regain our ability to focus are solid. The tips provided in the book to free yourself are also solid. Some of which I discovered for myself already. I even like the idea of having a non-digital hobby. Do something with your hands, such as woodworking or playing a musical instrument, which is something I’m thinking about. However, the part about connecting with others in this new post-social media world is wishful thinking. For the vast majority of people, it is over. They aren’t coming with us. And as tough of a time many of us had in escaping social media, it would be next to impossible for those less motivated to break free. Meanwhile, the engineers continually tweak algorithms to make the pull of these networks more powerful. After a decade of intensive programming by social media and smartphones, people have forgotten how to interact with each other. I’m not the only one to notice how much trouble Millenials and Gen Z have with eye contact. The glare of a screen is more comforting than an actual person. Perhaps I’m just an old Gen-Xer and this observation isn’t valid. But I do recall my circle of close friendships peaked in the 2008-2009 era. We gradually spent more and more time connected via social networks and less in person. And we mostly drifted apart. Occasionally we’d give a like to a comment or photo online. In prior times, when friends drifted apart, new friends would replace those. I’m seeing less and less of that these days. People are connecting online primarily. And those connections are being managed by a handful of tech companies that will use algorithms and advertising models to determine which comments by which of your friends you will see. Digital Minimalism provides a tip of creating or joining a social group around a hobby. OK. Let’s explore that idea since it is something I have experience with. Since 2007, I have attended or hosted over 1,000 Meetups, mostly with the Coffee Club of Seattle. And as successful as that group has been, I see hundreds of other groups fail to attract members to attend their events. You can sense the frustration these organizers are having in building social networks when they are competing with the tech giants. Getting someone to step away from their laptop and drive miles away to meet strangers is a big ask in 2019. In 2009, it was an easy ask. A big edge our group has is that it built up large numbers (now over 2,000) before social media won. It is easy to get 5 or 10 people to show up to an event when your membership is in the thousands. There is also an irony in that we now need the networks provided by social media to build the offline groups we want to use to escape the shallowness of social media. Another thing that has changed over the years is that when these Meetup groups do get together, members are often on their phone engrossed in their social media. Topics are more likely to be about memes or viral videos. We escape social media only to get together to discuss social media. I hate to sound so pessimistic on this point, but I felt the book didn’t really connect the dots on just how much society has changed in the last decade. For most people, I am assuming, regaining lost focus is not a priority. Feeling connected, even if it is shallow and fake, is a better choice. Digital Minimalism is still the correct path for me. Even though I feel more isolated, I am also calmer. I still have more work to do and I have yet to find an analog hobby that suits me, but I’m on the right path. If this topic is of interest to you, check out the book or just skim Digital Minimalism Book Summary by the Tidy Engineer. @Colin – Thanks. Oddly enough, my very next post will be on urban hikes.